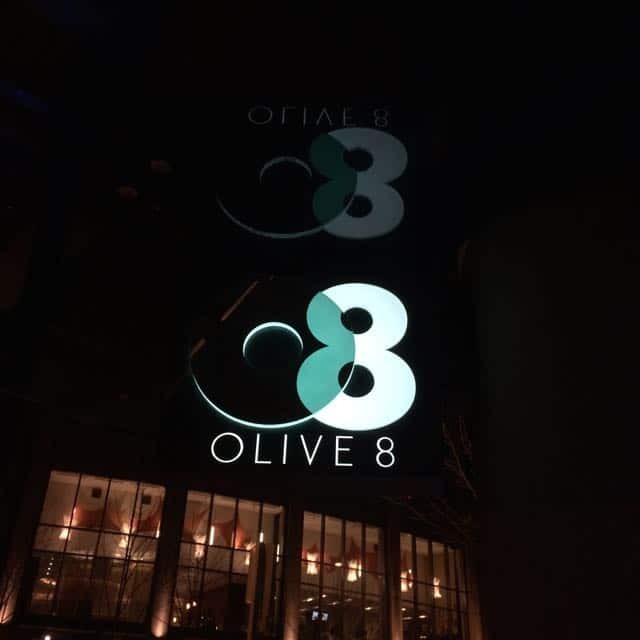 Loyal Hyatt visitors to Seattle are faced with a tough decision: Grand Hyatt or Hyatt Olive 8. There is also a Hyatt Place and a Hyatt House (opening May 2015); however those properties are outside the downtown core. If you are in town for a conference or vacation you will want to stay central. And both the Grand Hyatt and Hyatt Olive 8 are at the center of Seattle — a few blocks from Pike Place Market and waterfront to the west; Capitol Hill to the east; Amazon headquarters and Space Needle to the north; and the CBD to the south. Both properties are a block from the Convention Center. 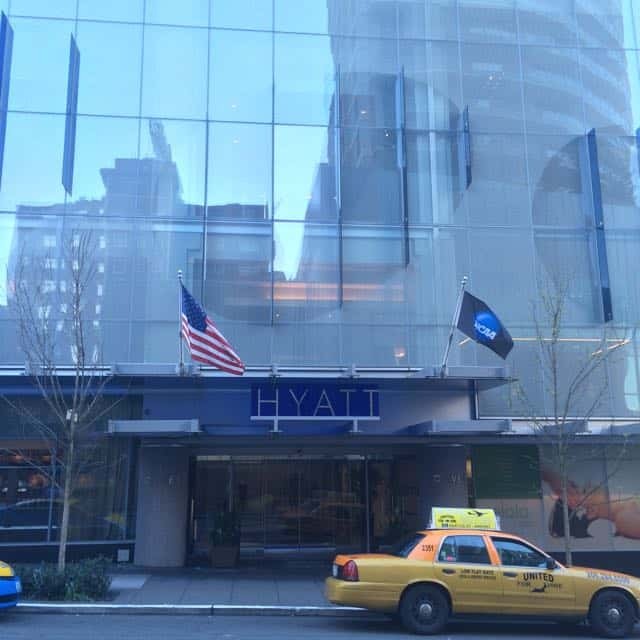 The Hyatt Olive 8 takes great pride in being the first LEED certified hotel in Seattle and highlight their environmentally conscious features. It is also one of the newest hotels in downtown Seattle (although there are a number under construction since the economy rebound). The hotel takes up the first 18 floors of the Olive 8 building. Check In: The check in process at the Hyatt Olive 8 was painless. I was staying during March madness and at least one team was staying there but they had already checked in. I was asked if I wanted turn down service and what newspaper I would prefer in the morning. I asked about any upgrades but they said they were sold out. The whole process took less than 5 minutes and was very professional. I thought everything was fine until I received a knock on my door from a bellman. Apparently there had been a room mix up; even though my key had let me in their records showed that I was in another room and that someone else had been assigned my room. They got it fixed no problem and didn’t bother me again. Room: I was in a standard room (Deluxe King). The rooms are small but efficient. Like many European hotels, you have to put your key in the light switch in order to turn on the lights. The closet and bathroom both make use of barn-style doors. Floor to ceiling windows allow in a lot of light even if the view isn’t very good. In one corner was a bench and coffee bar. Starbucks branded coffee and tea. Under the coffee maker was a “cold box”… basically an ice chest. Didn’t seem too useful but I suppose it is more energy efficient than a regular mini-fridge. The room was relatively quiet at night, however beginning at about 7:00am I could hear lots of doors opening and closing elsewhere on my floor. I was impressed by the technology that was useful but not over the top (like some hotels). 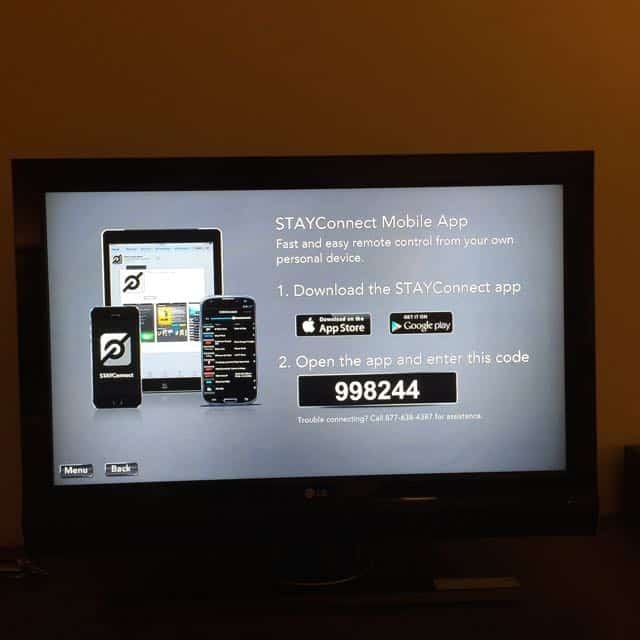 I was able to download an app to my iPhone to control the TV as well as order “Hyatt Has It” amenities as needed. You were supposed to also be able to use it to check out, however the system was not working. There was also a hub on the desk with various plug ins for video, audio, internet, power, etc. There were also outlets on both sides of the bed; one of which had an adapter that enabled you to plug in up to four devices. The bed was comfortable. As you can see, they provided five pillows. Some people that like to sleep warm might have been disappointed as the duvet was very light weight. Two styles of robes provided as well as a set of slippers. A safe was also in the closet. Bathroom: As noted earlier, the bathroom door was a barn-style with frosted glass. Great for one person, but if you are with someone else this does not provide the highest level of privacy. The bathroom was small but adequate. 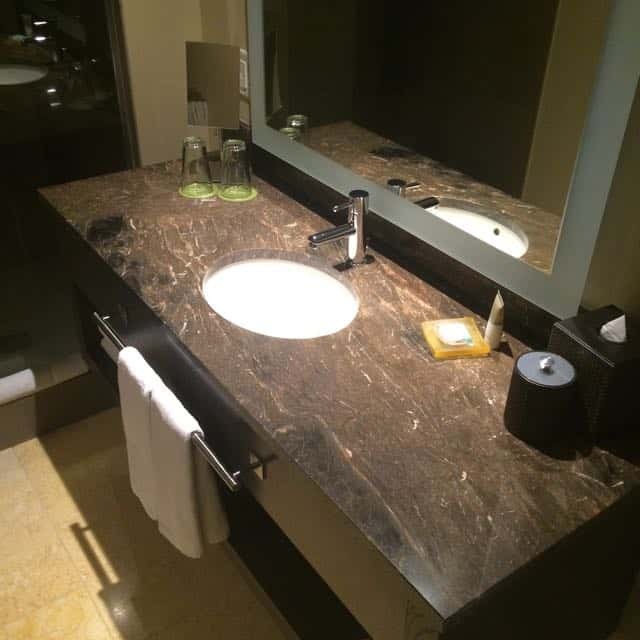 Single vanity with large mirror. Large walk-in tiled shower (no tub) with glass partition and no curtain. Open air which I prefer. The shower head was low flow (eco-friendly I assume) and not a rain shower head. Good height however (I am 6’1 and had no problem). Another nice touch was that the controls for the shower are on the opposite side of the surround, so that you can turn on the water without getting wet. It did take a while to get warm water but it was hot when it warmed up. Amenities at the Hyatt Olive 8 were KenetMD that I have seen in Hyatt Regency properties. Toothpaste and other standard amenities were also provided. 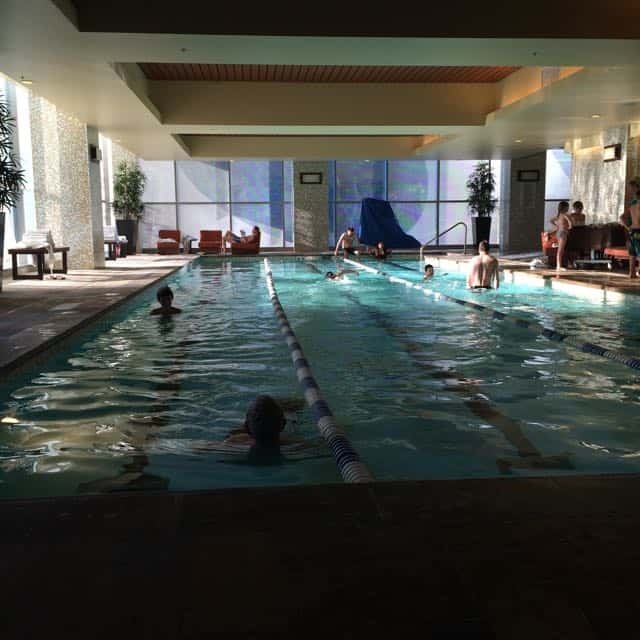 Pool: On the third floor of the Hyatt Olive 8 is the pool, gym and spa. 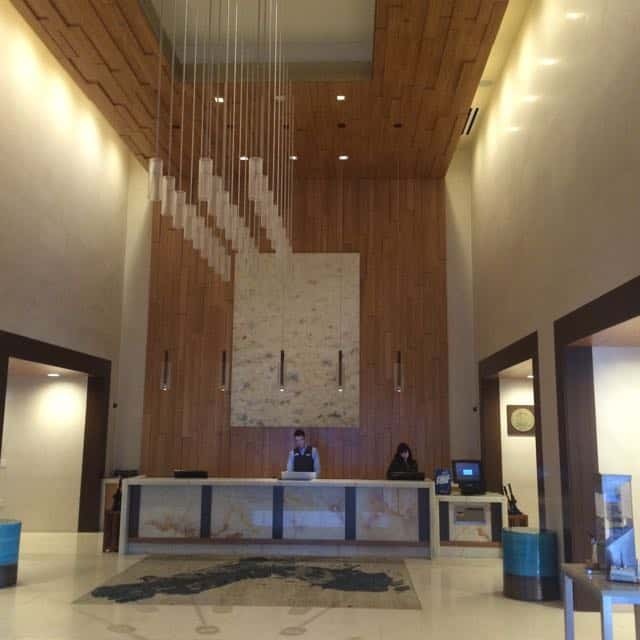 The hotel shares these amenities with the condos built above the hotel, however you would never know it as there is a separate elevator for residents. The indoor saline pool is designed for lap swimming and surrounded by floor to ceiling windows. There are various lounge chairs around the pool but I found the room to be too hot to enjoy sitting around. There was a large group that included kids (it was the weekend), however I would not say that this hotel in general is very kid friendly (bonus for me!). The hot tub was large and jetted. 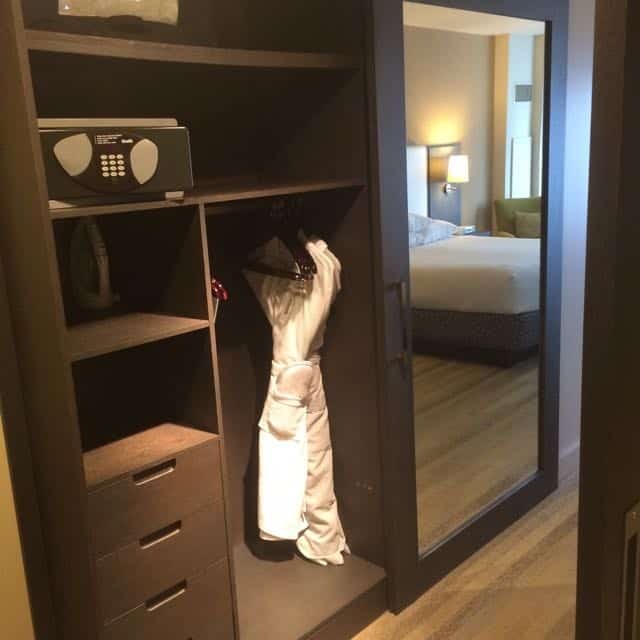 The pool locker rooms are shared with the spa and include steam room and sauna as well as spa amenities like razors and luxury bath products. The gym was relatively large and clean. Service: Overall I was impressed with the staff. They were attentive and friendly. When I had a problem with my wifi (I think it was related to the mix up of rooms), the front desk helped to resolve it quickly. When I ordered deodorant, mouthwash and floss from the “Hyatt Has It” menu on the app, the items were delivered within five minutes (although they forgot the mouthwash). The wifi (once working) was fast. As a Platinum member I received the premium wifi (usually $10 a day). The front desk said that the charge would come off my bill because of my status and indeed it did. I also appreciated that in the elevator there was a screen with rotating information. One of the “slides” was a reminder that the hotel’s quiet hours were 10:00pm to 7:00am. Bottom Line: You can read my review of the Grand Hyatt here, but overall I liked the Hyatt Olive 8 stay better. However, if you are a Hyatt loyalist, I think you would find the Hyatt Olive 8 a step up from Regency with a more boutique feel. I don’t see how you could go wrong with a stay here while visiting Seattle.